Last time out, I asked a question regarding which room of your house has received the most attention from your woodworking efforts. Your willing and numerous responses were, once again, interesting — and all over the map (or the house, to be more accurate). Bedroom to laundry room, basement to attic — no place is safe from your efforts. I was truly impressed with the variety of your home product production. And, as promised, you can read more about what your partners in crime are doing in our Feedback department. So now I have another question: what do you think of fancy figured wood? Does all that curly and eye-popping grain draw you in, or put you off? Do you dream of building with bird’s-eye, or fear the flame-maple? Is plainsawn your preference, or is quarter- or riftsawn where you are at? Enquiring minds want to know! SMART-BIT from Starborn Industries as a pre-drilling and countersink tool with a countersink portion proportionate to the head of each corresponding screw size. Until mid-February 2011, Fox Chapel is offering a special issue magazine, Pyrography, a 112-page publication with instructions for a variety of woodburning projects and techniques. Amana Tool, in partnership with Lonnie Bird, has released a set of four multi-use router bits that can be used to create a set of two stacking boxes as well as their other uses. The new JawStand is both an adjustable clamping aid and roller stand in one tool. Here’s a simple solution for storing all of the spare parts, small attachments and wrenches you get with a new tool. Storing chisels in my tool bag has been a real challenge. When I’m making rails for cabinet doors using my cope-and-stick router bits, I can eliminate tearout from the end-grain cope cuts and work more safely at the same time. Scott and Gin Wayland-Smith are now the second generation to be building wooden spoons and other utensils in Montana. How Often to Clean Saw Blades? I know a clean table saw blade will cut better, but I’ve never read anywhere how often I should clean my blades? Getting the Hang of Hanging Doors? Is there an easy way to hold and mount the door so you have the same 3/8″ overlay all around? Fixing Indentations on Faux Wood? I have run across a very complicated challenge to repair scratch marks on a wood table that were not deep but looked more like indentations. After six years under the umbrella of Stanley Black & Decker, the Delta brand was recently sold to Chang Type Industrial Company Ltd. – a Taiwan-based manufacturer of woodworking tools. 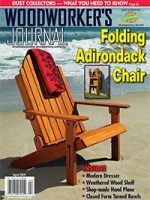 Rob’s query in the last eZine about which room of your house gets the most attention in terms of your woodworking projects really caught the attention of readers — we got a full house of replies.